Not all menu items are complete. 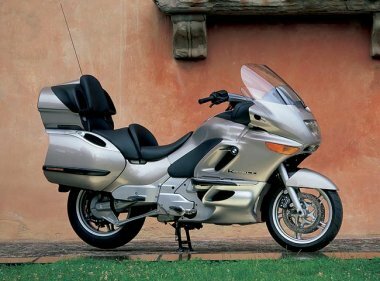 BMW K1200LT Luxury Touring Motorcycle. Liquid cooled 1200cc engine, dual over head cams, 4 valve per cylinder, electronic fuel injection, heated seats/grips, cruise control, linked ABS brakes, AM/FM weather radio, 6 disc CD Changer, 4 speaker pods, electricly adjustable windscreen, etc, etc. The K1200 is designed for one purpose. Chewing up miles in comfortable style. Beyond the features, one thing that catches many by surprise is how nimble this bike is. Weighing in at nearly 900lbs, it's amazingly supple and easy to handle. Bred for the German Autobahn, you can feel her eagerness to effortlessly glide through the twistiest mountain pass. This marvel of teutonic craftsmanship begs to be ridden. Likely the only bike you can ride for over 800 miles in a day and leave you wanting to do it again, day after day.